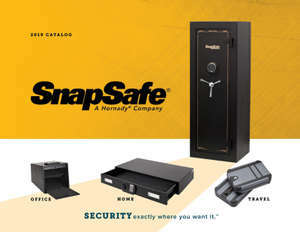 Protect your handguns, valuables and sensitive documents in a durable and portable Ruger® branded lock box from SnapSafe®. Available in two sizes, these lock boxes meet TSA airline firearm guidelines* and feature heavy duty 16 gauge steel housing. Secure to immobile objects with the 1500 lb. rated cable featuring a patented connector that allows maximum interior storage space.